I’ve got an interesting series of photos to show you today, sort of a follow up to my recent post titled The Hunter and the Hunted. 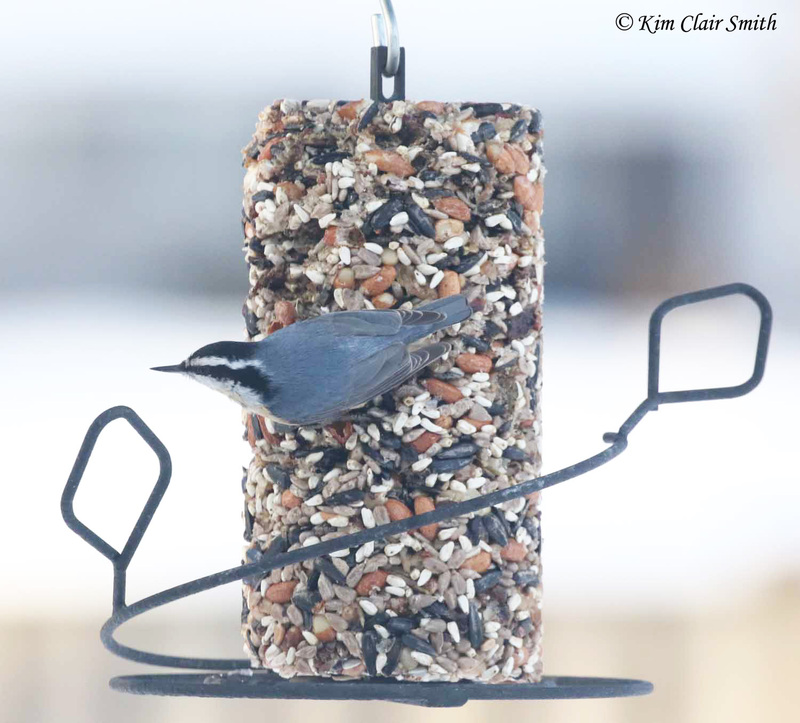 The other day I glanced out the kitchen window and saw a red-breasted nuthatch (Sitta canadensis) frozen in place on the side of the suet cylinder. 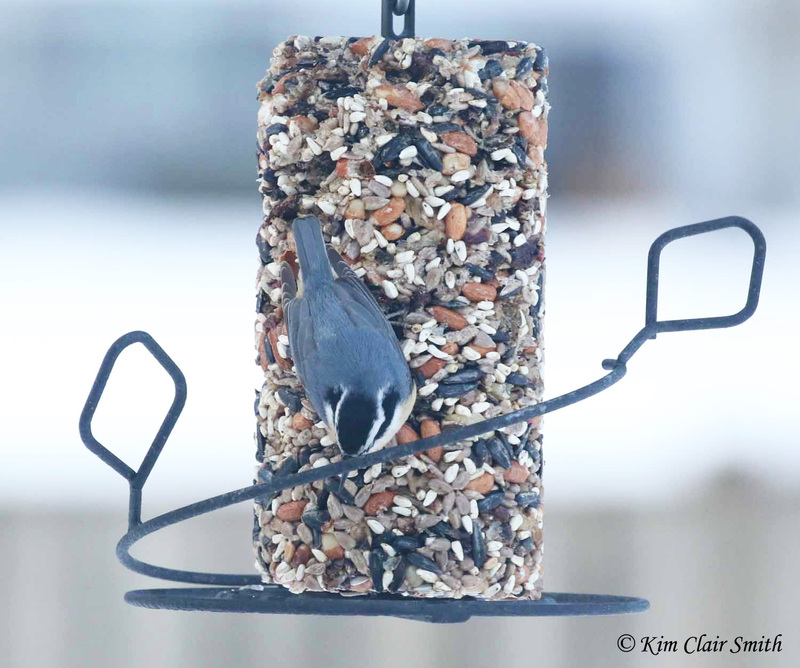 In the classic nuthatch pose, facing downward, he wasn’t moving a single muscle. That simple sign told me there was a winged predator in the yard; sure enough, it only took a few seconds to find a mature Cooper’s hawk (Accipiter cooperii) perched in the big silver maple tree. The hawk’s view of the nuthatch was probably blocked because he was on the back side of the suet. But the little guy wasn’t taking any chances, and continued to “make like a statue” even after the hawk flew across the yard to perch on the fence. Even from his new location, the hawk couldn’t see the nuthatch. You may notice that this isn’t the same immature hawk that was here the other day. 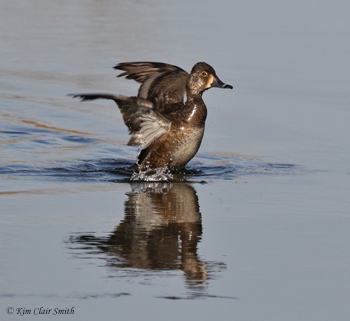 This one is an adult, as indicated by his red eyes and more solidly-colored breast plumage. After about 45 seconds on the fence, the hawk dropped down behind the large cypress shrub, and the nuthatch still didn’t move. As I was enjoying the drama of this scene, I was also glad to have a nuthatch who wasn’t moving so I might have a chance to get better photos of him, though I was still hampered by the double-paned window. The hawk remained behind the cypress for at least 15 minutes. I’ve seen several hawks drop down behind there and stay for a good amount of time, possibly feasting on the birds who like to shelter inside. When the snow melts a bit, I’ll have to check to see if there are piles of house sparrow feathers back there. But anyway, when the hawk had been out of sight for about four minutes, the nuthatch began to move verrrry slowly. First he turned around and waited for a couple more minutes. 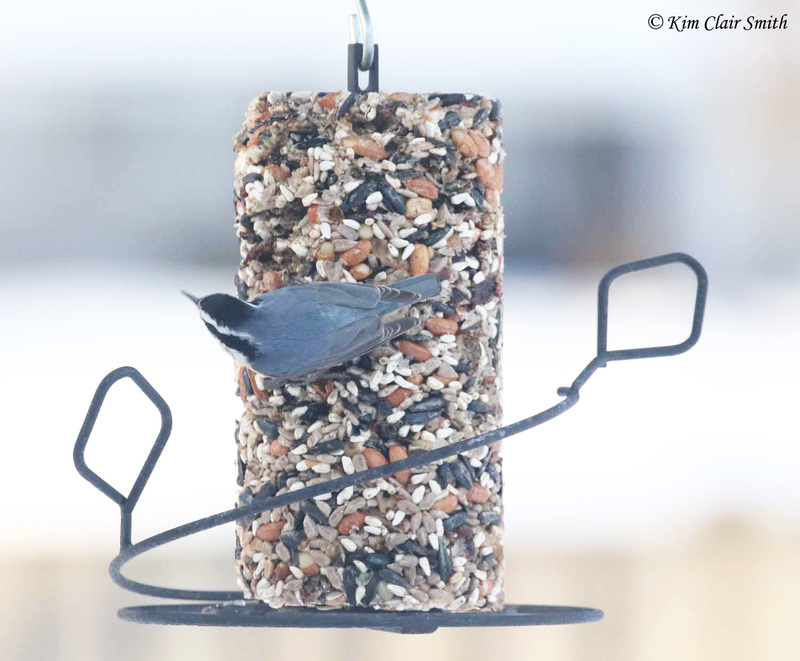 Continuing to be exceedingly cautious, he slowly creeped up and peeked up over the top of the suet. Finally he felt the coast was clear, and took the opportunity to fly to the relative safety of the big cedar tree. I don’t know if the Coop would have even bothered with a meal as tiny as a red-breasted nuthatch, but I don’t blame the little one for putting on his cloak of invisibility for a few minutes, just in case. This entry was posted in Birds and tagged bird drama, hawk, nature, nuthatch, predator, prey, raptor. Bookmark the permalink. 14 Responses to Quick, Make Like a Statue! 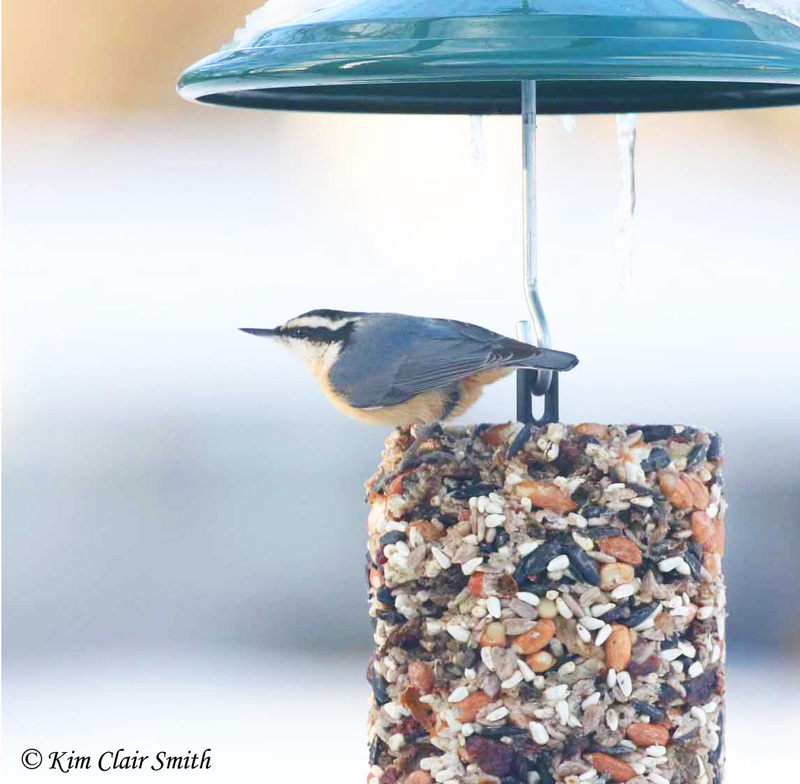 Kim, no one can hold a pose longer than a Downy Woodpecker or a White Breasted Nuthatch. I saw one stay still for almost 15 minutes. Talk about discipline. They do better than a 6 year old child! Marian, I suppose it’s easier to find the discipline when it’s a matter of life or death! This drama gets played out in my yard very frequently this winter. Fortunately for the songbirds trying to grab a morsel at the feeders, the hawks don’t score very often. It must be exhausting being a hawk, don’t you think, Gail? I wonder what their success rate is when hunting. Love getting a good look at a red-breasted nuthatch! Thank you Kim. Aren’t they adorable, Ardys? Great little birds. What entertainment! Truly, these tough little birds are used to the big fellas and they’re quick to scatter or hide. I know you let nature take its course, but when I see a hawk around, I run out to scare it off. I’m the big girl around here and if I can stop an attack I do. However, lately we have an adult cooper’s hawk that isn’t a bit afraid of me. I can get within ten feet and he’ll just sit there and stare at me. But if I have my camera, he takes off immediately. Maybe the camera has a more threatening appearance! Pure delight, Kim! Well done! High drama unfolding in your garden! Good pictures and an interesting story. Thanks, Lisa, glad you enjoyed it!